This card was made by Mary Ellen Byler who presented this year at convention. She is a twenty-something Amish gal who is tremendously successful as a Stampin' Up! demonstrator. She also has a great sense of humor! I have heard that she travels to the library to place orders and get online to Stampin' Up! since they have no electricity in their home. Truly an amazing gal! 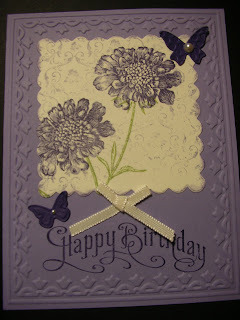 Her card is made using the Field Flowers and Perfectly Penned stamp sets on Wisteria Wonder and Very Vanilla cardstock. She used Concord Crush, Wisteria Wonder and Pear Pizzazz inks.